Electric vehicle (EV) drivers who want to drive beyond the range of their car are on the lookout for fast-charging stations that, just like a gas station for gas-powered vehicles, bring them back up to full capacity (although EV charging takes a bit longer). In Minnesota, the network of charging stations is expanding, and some locations offer amenities that can provide opportunities for both personal enjoyment and support for the local economy. At Drive Electric Minnesota, we decided to map out fast-charging locations and their proximity to amenities for EV owners across the state. One of the largest perceived barriers of driving an electric vehicle (EV) is range anxiety, or being stranded in the middle of nowhere with no place to charge. The fear is akin to running out of gasoline or diesel, though those of us that have been driving an automobile since it was legal to do so have become accustomed to monitoring our fuel gauge to prevent this from happening, and we have a plethora of gas stations from which to choose. For EV owners, their home (and sometimes their workplace) becomes their primary fuel station. Instead of only fueling the vehicle when the gauge is low, they plug their charging cable into their vehicle when it’s parked at their house. Typically, this occurs at night to take advantage of time-of-use rates. For daily commuting, this works perfectly for most vehicles that have a range of 100 miles or more on a single charge. However, drivers that want to take their EV on a longer trip will need to charge at one or more DC fast chargers (DCFCs), depending on their route length and battery capacity. Today’s fast-charging technology gives an EV about 80 miles of range with about 30 minutes of charging. Technology currently under development will make charging faster – eventually offering gas-station levels of speed (~300 miles of range with 5-10 minutes of charging – equivalent to average stop-times at gas stations today). Admittedly, a stop at a DCFC with today’s technology typically takes longer than a stop at a gas station, but it also provides a wonderful opportunity to slow down and relax in a world that often feels hectic. As EV advocates, we found ourselves wondering, “What kind of common amenities (restaurants, shopping, etc.) are available for EV drivers near existing DCFCs in Minnesota?” Since this analysis wasn’t available elsewhere, we decided to find out. Locations that offered the least amount of options tended to be located at auto dealerships or a significant distance away from city centers. For a full list of DCFC locations in MN, click here. 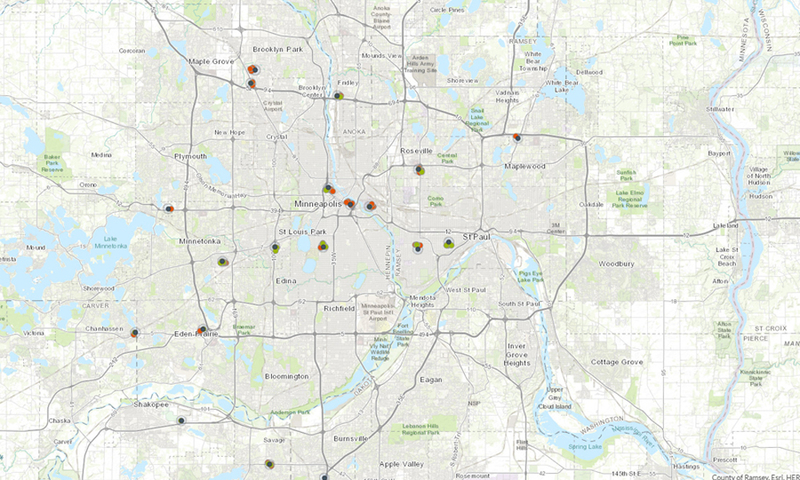 We were pleasantly surprised to find that the majority of DCFC locations in MN offer a variety of options to EV drivers needing to spend 30 minutes somewhere while their vehicle is charging. An interactive map of the analysis is displayed below. Using the tool, you can zoom in on any DCFC in the state and easily see amenities nearby. 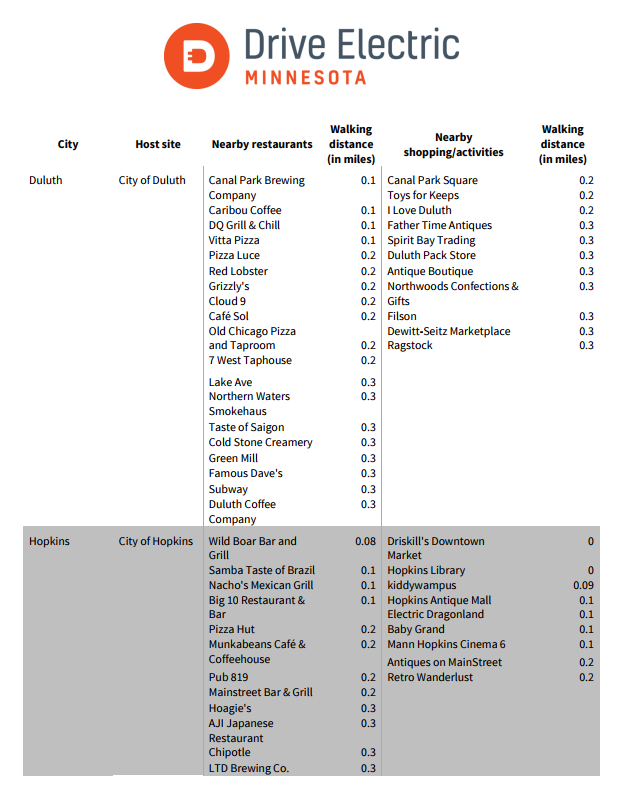 DCFC are represented by gray dots, restaurants are represented by orange dots, and shopping or other activities are represented by green dots. For a full size map, click here. As the state continues to grow its charging infrastructure, we encourage city officials to offer up desirable host sites, like those in Duluth and Hopkins, that offer a range of options for EV drivers to spend time in. With the right planning, future DCFC locations will not only offer a place for EV drivers to charge, they’ll also help boost the local economy by offering EV drivers a desirable place to spend some idle time.